Pool Mart is your "One-Stop-Shop" for all your swimming pool and spa supply needs and repair services. We have industry experts on stand by ready to take your call Monday through Saturday 8AM - 5PM EST. Ask any question you want. Our staff has over 40 years of experience in the pool and spa industry. We carry virtually all brands of swimming pool equipment and chemicals. Give us a call if you don't see what you are looking for on the site - because there is a good chance we have it - and can sell it at a discounted price. We specialize in troubleshooting various types of inground, above ground, and infinity pool problems. We are committed in helping you select the right equipment to fit your swimming pool or hot tub. Everything is shipped to your door absolutely free in the Continental U.S. Shop with confidence as we were one of the first authorized Baquacil, Baqua Spa, BioGuard, Polaris, Kreepy Krauly, Baracuda, Zodiac, and Hayward Navigator Parts Dealers on the Net. Protect your home and valuables with the water stored in your backyard swimming pool. Your pool is like a fire truck always on the scene ready to protect your home from a wildfire. 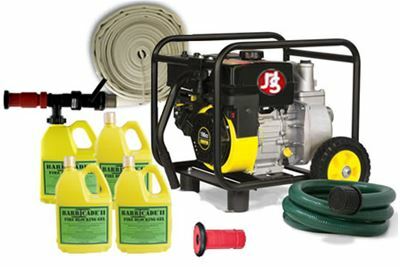 Due to the recent California Wildfires such as the Camp Fire and Malibu Fire, we are offering free shipping on our portable fire pump and hose packages. Every homeowner with a swimming pool should have one of these systems ready to go at all times.